We released PSOFT Pencil+ 4.1.0 for 3ds Max which supports 3ds Max 2019. This update adds the ability to output to PLD files for use with the new PSOFT Pencil+ 4 Line for After Effects (page in Japanese) as well as the Pencil+ 4 Line Renderer used to render only Pencil+ 4 Lines. It also includes various bug fixes. 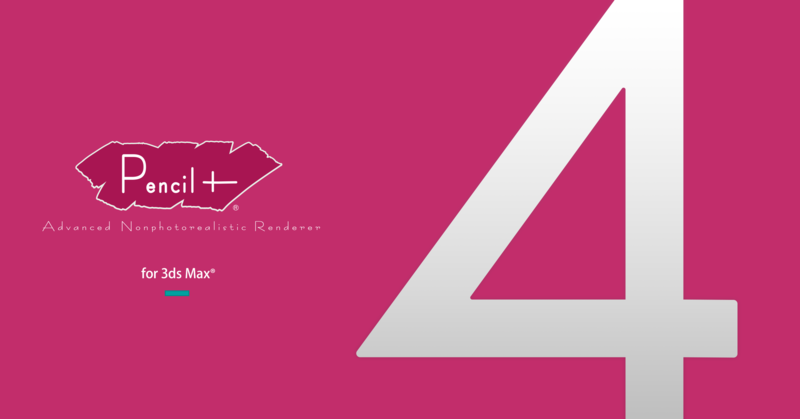 Registered users of Pencil+ 4 for 3ds Max can update their products for free. Added the "Pencil+ 4 Line Renderer" which processes only the drawing of Pencil+ 4 Lines. Added the new PLD file format to "Pencil+ 4 File Output". Added compatibility with 3ds Max 2019. Please refer to the release notes for information about fixes. PLD is a dedicated data format for editing Pencil+ 4 Lines with Pencil+ 4 Line for After Effects (link to Japanese page). The Pencil+ 4 Line Renderer is a simple renderer which only performs Pencil+ 4 Line computation. It can skip material computation and render only Pencil+ 4 Lines. When using the Pencil+ 4 Line Renderer, rendering is performed with a white background. It can be used for Render Elements and Pencil+ 4 File Output.